Symphony Parnassus is thrilled to welcome back one of our favorite soloists, Alina Ming Kobialka, who will perform the Brahms Violin Concerto on March 18 with the orchestra. This is Alina’s fourth concert with Parnassus; her prior appearances were in 2010 (at age 13), 2013 and 2015, performing the Barber concerto, the Sibelius concerto and Prokofiev Violin Concerto No. 2, respectively. Playing the Brahms this time around is an opportunity she has sought for years. She loves all types of music, but Romantics—like the moody and spirited Brahms—are her favorites. “I feel that I am a very emotional player, and that type of music resonates with me the most,” she said. Alina grew up in a musical family and as a child, certainly heard a lot of the violin repertoire being played: She is the daughter of San Francisco Symphony second violinist Chun Ming Mo and retired SFS principal second violinist Daniel Kobialka. As a young child, Alina started playing violin for fun, and her parents saw her potential and she began more intense lessons. “Even though I was not a fan of the practicing part as a kid, I grew to love my instrument and I would not give it up for anything,” she said. She has studied violin for 16 years and attended Colburn School Academy. Her first teacher was Li Lin and she continued to study with Wei He as a part of the San Francisco Pre-College Division. 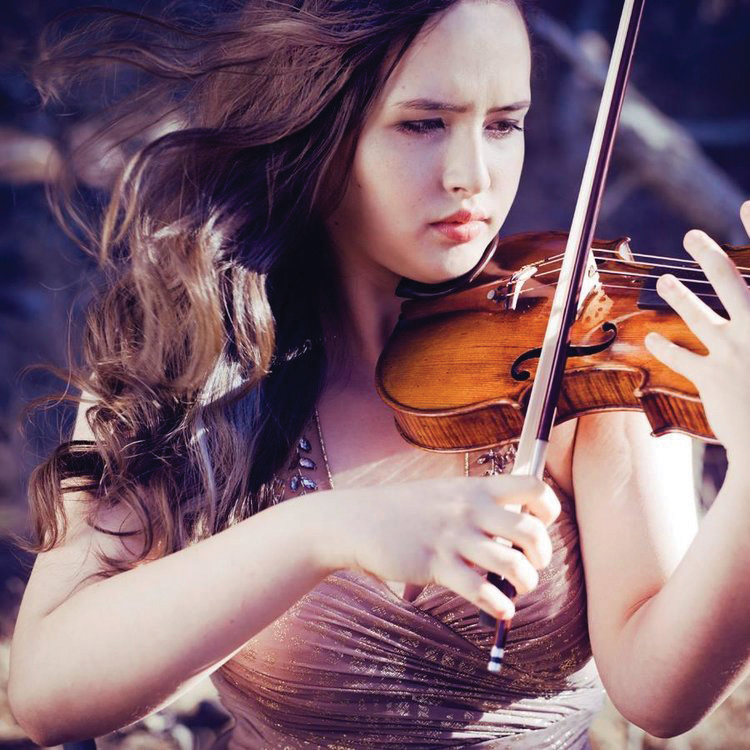 Alina now studies music at DePaul University, but will transfer in the fall to Cleveland Institute of Music in Ohio to continue studies with renowned violinist and teacher Ilya Kaler. 1) What was the inspiration for Sinfonietta? I came up with the idea to write this piece as a challenge to myself. Since the majority of my musical career is performing in an orchestra playing symphonies, I thought it would be a good exercise to try to write something in a symphonic form. I chose to write for brass and percussion because that is what I am most familiar with, being a trombonist myself! I drew inspiration from composers like Shostakovich and Bruce Broughton to come up with the harmonic and formal material of the Sinfonietta. 2) Has this piece been publicly performed before? The piece has been performed twice: by the San Francisco Conservatory of Music brass ensemble and the Chicago Symphony Brass section. 3) What inspired you to become a composer after becoming a professional trombonist? Music performance is a very specific side of the orchestral world. Arguably, it is the midpoint between the composer and the audience. What the composer feels and how the audience feels listening to the composer are all that matter in the end. Performers are just skilled translators. I chose to explore composition in order to experience another side of the music process. In doing so, it informs my views of music performance. 4) How does it feel to have your SFS colleague—Symphony Parnassus Maestro Stephen Paulson, also principal bassoon for SFS—conducting your work? It's a thrill to have such support from Steve Paulson. We have a very strong community in the SFS, and I am very touched that Steve would give me the opportunity to have my music heard on his program. Composer Timothy Higgins’ piece, Sinfonietta, for brass ensemble and percussion, will open the March 18 concert with Symphony Parnassus. Higgins, principal trombone with the San Francisco Symphony, in the Robert L. Samter Chair since 2008, is a Houston, Texas, native who began composing several years ago for players in the orchestra and other musician friends. His compositions and arrangements have been heard in San Francisco Symphony chamber and holiday concerts. Prior to his post in San Francisco, Timothy was the acting second trombonist with the National Symphony Orchestra in Washington, D.C. He has a bachelor’s degree in music performance from Northwestern University and has performed with the Milwaukee Symphony, Virginia Symphony, Chicago Symphony, Civic Orchestra of Chicago, Music of the Baroque, Grand Teton Music Festival, Sun Valley Summer Symphony, Washington National Opera, and Baltimore Symphony. In addition to his busy performing career, Timothy is a sought-after arranger of music. He was the sole arranger of the National Brass Ensemble’s Gabrieli recording. Additionally, he has arranged music for CT3 Trombone Quartet, National Brass Quintet, Bay Brass, and the San Francisco Conservatory of Music Brass Ensemble. He has also composed works for brass instruments in solo and chamber settings. His arrangements and compositions have been performed by the Washington Symphonic Brass, the Bay Brass, the San Francisco Symphony brass section, the Chicago Symphony brass section, the Los Angeles Philharmonic brass section, and numerous university brass ensembles . His arrangements and original compositions are available through his publishing company, 415Music. As a teacher, Timothy been a faculty member of the Pokorny Seminar since 2012, and is currently on faculty at the San Francisco Conservatory of Music and at Northwestern University. He has also led masterclasses in Japan, China, Canada and the United States, including classes at the Royal Conservatory in Toronto, the New World Symphony, and the Juilliard School of Music.